A beer that conserves water? That's the closest thing we can think of to a guilt-free beer! 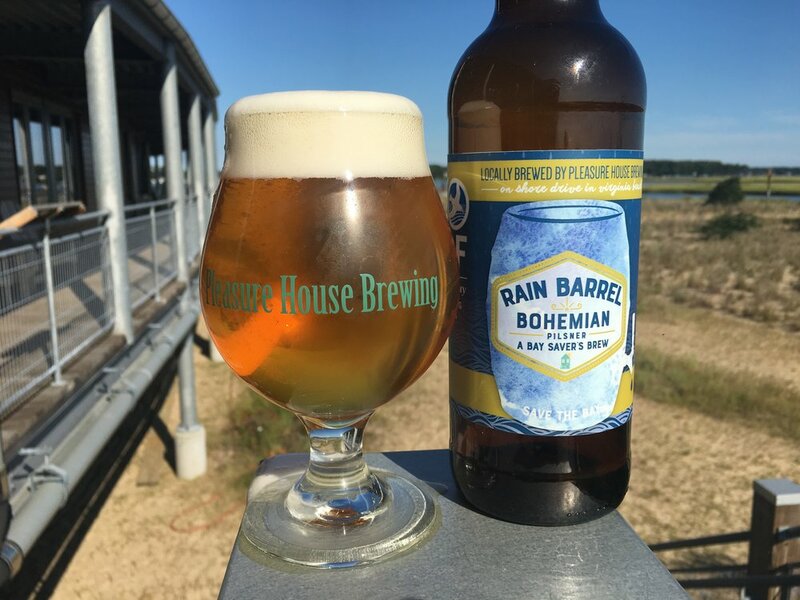 Virginia Beach's Pleasure House Brewing teamed up with the Chesapeake Bay Foundation to brew a beer using rainwater collected at CBF's nearby Brock Environmental Center. The Bohemian Pilsner, called Rain Barrel: A Bay Saver's Brew, made its debut last weekend at "Save the Bay Family Day" at the Brock Center. Only a handful of breweries around the country have used rainwater to make beer. "Brewing is so water-intense," said Drew Stephenson, co-owner of Pleasure House Brewing. "That's why we do whatever we can to recycle and conserve water." The rainwater collection system at the Brock Center is the first of its kind in the U.S., permitted to treat rainwater to drinking water standards. When rain falls on the roof, the water is funneled into two large cisterns, with a flitration system that allows it to supply all of the building's water needs. Environmental engineers have certified the rainwater is safe to drink. The first batch of Rain Barrel beer took 300 gallons of collected water. That's about how much the building captures in a single summer thunderstorm. In early August, Cape Henry Launch Services, which delivers drinking water to ships, trucked hundreds of gallons of treated Brock Center rainwater across the Lynnhaven River to Pleasure House Brewing. The large tank was then raised up on a crane, where the water was gravity fed into brewing vessels. When beer-drinkers first tasted the Rain Barrel beer this weekend, it was deemed a hit. More than 75 gallons were consumed at Save the Bay Family day, and plenty of craft beer lovers really liked the taste. Beer enthusiasts in Virginia are advised to start doing a rain dance now, to keep the beer flowing.